It scored less in process efficiency and management. Not because the inefficiencies have increased (in fact the sector as a whole improved in all process efficiency parameters), but because the benchmarks were tightened and made more realistic during the second rating. The sector has made significant improvement in the enunciation and enforcement of corporate environment policy and management system. 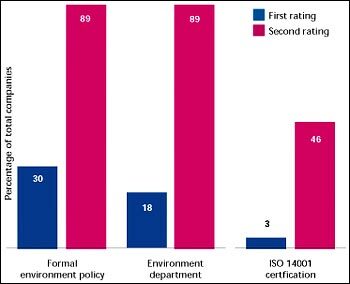 During the first rating, only 30 per cent of the mills had a formal environment policy. This increased to 89 per cent during the second rating. Sixteen mills adopted their policies between 2000 and 2002. Indian paper industry was, and still is, notorious in its misuse of water. It was therefore not surprising that the first rating showed that average water use in Indian companies was as high as 200 tonnes per tonne of paper produced -- ranging from 175 tonnes, to a staggering 415 tonnes of water used per tonne product in Ballarpur industry's Shree Gopal unit. But things have now changed for the better. From an average of 200 tonnes water consumption per tonne of paper in 1998, the average water consumption has reduced to 135 tonnes per tonne paper in 2002. This represents one-third reduction in water consumption, a significant reduction. But still there is a long way to go. 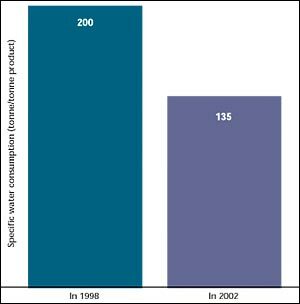 Current consumption levels remain far higher than the global best practice. 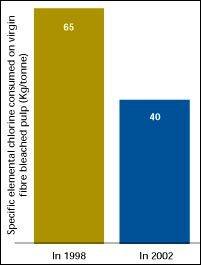 One of the key concerns of GRP was the industry's high consumption of elemental chlorine to bleach its paper. The use of chlorine leads to high organochlorine loads in the wastewater. Globally, the industry has moved towards elemental chlorine-free technology (ECF) or total chlorine-free technology (TCF). But in 1999, all Indian mills were still using elemental chlorine bleaching. By 2002, the scenario had not changed drastically. But GRP found that all companies had become conscious of their chlorine load and taken measures to reduce total chlorine consumption. It is great that ITC Ltd-Bhadrachalam unit now has ECF technology. Can others follow? Where is the raw material coming from? 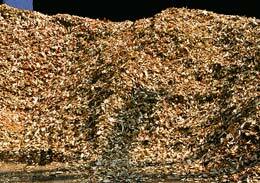 Paper mills are voracious users of wood and bamboo. But this need of the industry, which has decimated forests, can also become its great strength. Paper mills can generate huge employment and provide livelihood support by sourcing wood from farmers. In this rating, raw material sourcing as an indicator shows major improvement. Industry is now increasingly sourcing more and more of its raw materials from farm and social forestry. It is investing in research and development to improve the productivity of plantations. 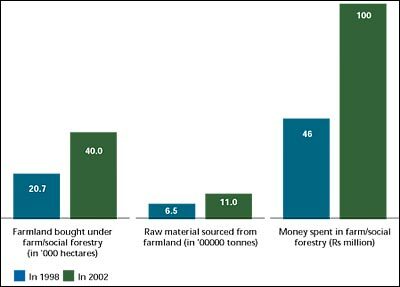 As a result, land under the farm and social forestry programmes has doubled: from 20,000 ha in 1998 to 40,000 ha by 2004.